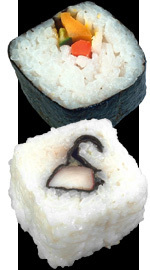 Maki is the common paper-thin layer of toasted seaweed topped with rice and stuffed with thin pieces of raw or cooked fish, shellfish, egg or vegetables and shaped into a roll. The rolls are cut into slices. Temaki is similar to maki but is cone-shaped, uncut and eaten by hand. Nigiri is best known; it consists of a piece of fish or seafood placed on an oblong-shaped finger of vinegared rice that's seasoned with a dab of horseradish. The fish is generally raw, however, shellfish are sometimes cooked. Sashimi is an assortment of sliced raw fish, such as tuna served on a platter with garnishes. All are eaten with distinct condiments, including gari (pickled sliced ginger), wasabi (Japanese horseradish) and shoyu (soy sauce). When you order or are served sushi or sashimi, your dish will come with a ball of green paste called wasabi, thin pink slices of ginger, and a small Japanese plate for you to pour the soy sauce into. Japanese research found that wasabi fights certain bacteria. Perhaps the most important where eating raw fish is concerned, wasabi is also effective against Anisakis parasites that live in fish and can enter the human digestive system. Some studies have even found that wasabi has anti-cancer properties. Tempura, sukiyaki, sashimi, sushi - even the words used to describe the most basic of Japanese dishes are exotic and beautiful. Japanese cuisine is easily one of the healthiest in the world, with its concentration on fresh fish, seafood, rice and vegetables.